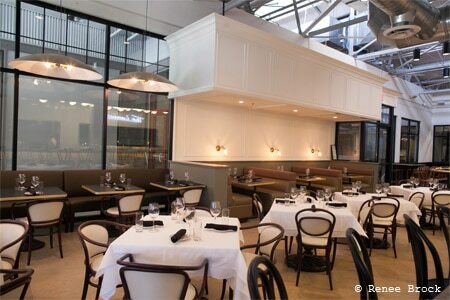 Chef Eli Kirshtein's American brasserie at the Krog Street Market development. Dinner Tues.-Sun. (closes early Sun. ), Brunch Sun. : Atlanta native and “Top Chef: Las Vegas” alum Eli Kirshtein is behind The Luminary, named for Atlanta's first newspaper. Design studio ai3 gave the space a simple yet contemporary feel. Crisp, white subway tile walls and sparkling stainless steel shape the raw bar, located to the right of the long mirrored main bar. Bright brass accents and deep, dark granite add contrasting notes. Start with chicken liver mousse encrusted in pistachios with pickled mushrooms, or the sweet pork belly surrounded by frisée. Or choose New Orleans barbecued shrimp, a Southern classic. Ample portions make them easy to share or function as small entrées for a light supper. Oysters from different parts of the country as well as clams are presented at the aforementioned raw bar. They are offered at half price for happy hour Tuesday through Thursday from 5 p.m. to 7 p.m. French fare includes duck leg confit, croque monsieur, and classic steak frites with maître d'hôtel butter. Classic Sauce Robert anoints a crepinette of pork. For dessert, the salty caramel ganache tart with a milk chocolate sorbet is a study in balance. The wine list, largely French with some American labels, shows intelligence in every selection. Service throughout is brisk and smart, from the cocktail crew to the waitstaff.